So this last weekend I had the pleasure of making a wedding cake for one of my very dearest friends. Since it was an October wedding, she wanted autumnal colors. I tried to deliver with a pumpkin orange, a kind of burnt reddish/purple and some of the green that I used on my own wedding cake. The cake itself was a lemon poppy seed with lemon buttercream, and a raspberry curd between the layers. It was a beautiful ceremony, outside, and performed by a mutual friend of the couple's. I hope my cake made a nice addition. I've already written a post about laying fondant on a cake, and you can find it here. For this version, I used a stencil (which I got here) for the basic design and then painted in additional details freehand. 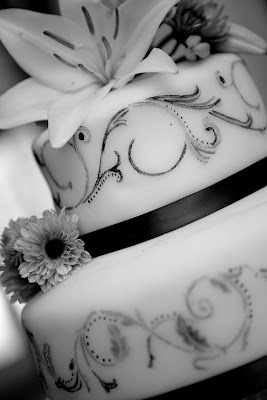 The stencil was easy to use, I secured it to the cake by wetting the fondant and by using medical tape. 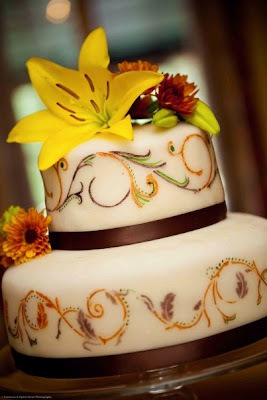 One thing I would say, if you plan to use a stencil, is that powder coloring is easy to use, moistened with a bit of lemon extract (or Everclear, as the woman at the cake shop told me!). You don't want to get the paint too wet, or it will tend to seep under the stencil. Barely moist bordering on dry is best. You want to dab the pain on with the end of a flat brush, rather than making broad strokes. But otherwise, it's easy as, well, cake! This is absolutely gorgeous! I bet it tasted just as good as it looks! WOW - this cake looks amazing. Great job. Andrea, you did such a beautiful job! I'm totally blown away! Rachel, you have to save the top tier for your one-year anniversary! Just wrap it and freeze it. Although I think that's a stupid tradition because one year old cake cannot taste good! what a gorgeous cake. I love the colour combination n the flowers on too. You are an artist. I made a wedding cake a few months ago too and I share the same passion /obsession for cake decorating. I dont do it too often tho nowadays...too much work but I love looking at others' cakes.Yours is magnificient. Wow! This is the kind of wedding cake I would have loved to have had. This is spectacular.